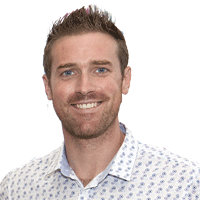 Will Johnston is the local 9am-3pm host for The Hits Bay of Plenty 95FM. He's also a celebrant and MC. I've never really bought into that notion of not knowing how great you really looked when you were younger, until you get old. I'm not saying that you shouldn't subscribe to the you do you motto and just do whatever you want with your own body. But I bet ol' Whiskers McGee (that's my official cat lady name for her) has a couple of regrets rolling around in that skin-tightened head of hers. I have no regrets about how I look. Then and now. Granted, if we go way back, I was on the chubbier end of the scale as a kid. I'm actually a big fan of people getting any procedure they want, as long as it's safe for them and it doesn't harm others in the process. Botox and collagen; fill yer boots, or lips. But for me I like to just age how I age. I'll control what I can, to an extent. If I don't want to put on weight I'll eat healthy and take my un-toned dad-bod for a run. If I look tired, I'll sleep more. If my skin is rubbish, I'll stop eating/drinking the foods/booze I know make it that way. I get it's not as simple as that for some people, but I reckon for most people it is. Sure, I have insecurities as much as the next not-quite-metrosexual dude. What I'm getting at is: ageing to me is one of the most beautiful things that a human can do. The two photos of me here are promo shots almost seven years apart. Exhibit A is from 2012, the other last month at the ripe old age of 34. I love the one from last month SO much! Truth be told, I loved the 2012 one too, at the time ... I'd been paint-rolled in makeup, airbrushed to within an inch of legally allowed to drink, dressed like the missing member of NSYNC and had a little bouffant of chest hair that had the 70s calling and asking for its shag pile rug back. Okay, to be fair, I still have that chest hair. Only now it's a bit thicker and occasionally my impending doom greets me out of the shower with a grey chest hair! The thing that really makes me happy about the latest pic is that it's basically untouched. There is lighting and they are not my own clothes. That's it. But the old pic doesn't bother me. Wrinkles I've gained since then don't even cross my mind on the daily. If anything I just find old photos of me to be super funny and serve as a great reminder of how much I grow as a human every year. And I am on the radio. Who actually cares what I look like, right?! Here's a sentence you probably didn't think you'd hear from a guy today: I'm trying to live more like Meryl Streep. She said: "Don't waste so much time worrying about your skin or your weight. Develop what you do and what you put your hands on in the world." Where is my glass of wine?! • Will Johnston is the local 9am-3pm host for The Hits Bay of Plenty 95FM. He's also a celebrant and MC.